Parties for kids not only center on fun games and activities but also on a menu filled with kid-friendly foods. There are many menu options to consider that can be tailored to a specific type of party and your child's food preferences. Whether it is an informal sleepover or a big birthday bash, planning a menu for a party can often be a challenge. You can look at sample menus to get an idea of what to serve at your party to simplify the process. Serve soda or a punch as beverage options. Sleepover parties are all about having fun with friends. 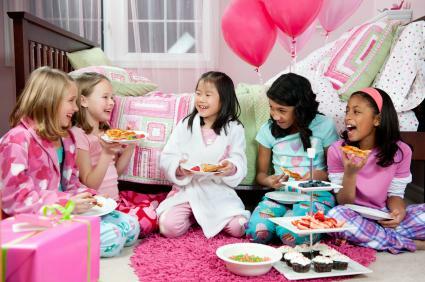 For this type of party, you will want foods that kids can snack on while talking and watching movies. With the large number of snacks, feel free to consider dessert an optional item for a sleepover party. Don't forget to include an assortment of drinks, like juice and caffeine-free soda, throughout the evening. Foods that are easy to eat and do not require sitting down are great for an outdoor party. 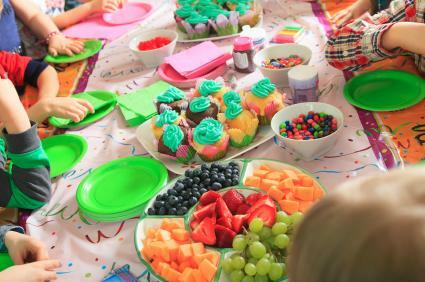 Since most outdoor parties involve games and other activities, kids will enjoy foods that they grab and eat on the go. Sports drinks and flavored waters are ideal options to drink while playing outdoors. Kids can decide on the items that they like and grab what they want in addition to what you are serving. If parents will be staying at the party, be sure to serve extra food. There is no need to make special food for the grown-ups. You can offer items that will appeal to kids and adults such as a fruit or vegetable tray, cheese and crackers, pretzels and chips, and of course, dessert.